Ed Orgeron is no longer the "backup plan" and instead is the new head football coach of the LSU Tigers, a source confirmed to ESPN's Brett McMurphy on Saturday. The school has scheduled a news conference for 1 p.m. ET. Orgeron's hiring was first reported by Football Scoop and The Advocate. LSU had zeroed in on Houston coach Tom Herman, who remains a candidate to take over as coach of the Texas Longhorns amid speculation that Charlie Strong will be fired. The source told McMurphy that LSU decided to go with Orgeron because it "wasn't going to be held hostage [while Herman negotiated with others]. ... In the end, they chose the guy who wanted the job and not the guy who wanted the money." 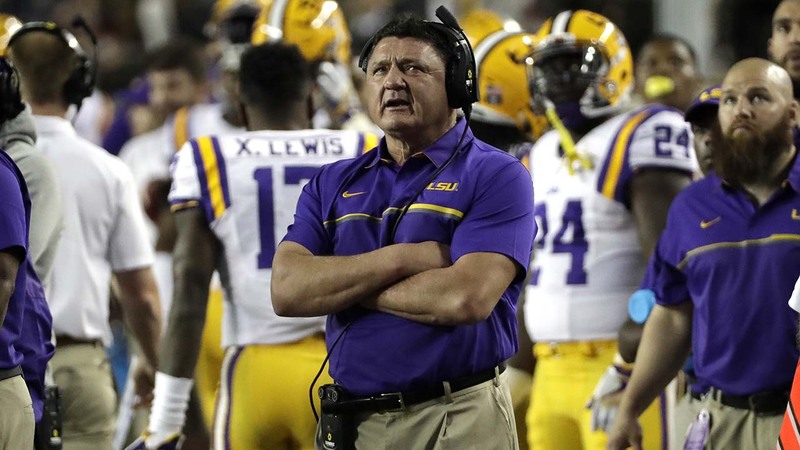 Orgeron, who reportedly met with LSU officials on Friday, has guided LSU for the bulk of this season after Les Miles was fired on Sept. 25, following an 18-13 loss to Auburn. The Tigers are 5-2 under Orgeron. TheAdvocate.com reported that Orgeron would try to hire Alabama offensive coordinator Lane Kiffin as his offensive coordinator and keep LSU defensive coordinator Dave Aranda. Several Tigers players voiced support for Orgeron following Thursday's regular-season finale against Texas A&M -- a 54-39 LSU win -- urging the school to make him its next head coach. "He's done a great job," LSU running back Derrius Guice said after Thursday's victory. "He's a family guy. He keeps us close. He reminds us that it's you fighting for your brothers. ... We're all one heartbeat. I want Coach O to stay. We need somebody like Coach O to lead us out there." Orgeron is 11-4 as an interim coach in stints at USC (2013) and LSU.